Back in April I wrote about our Top 25 Read-Alouds (for ages 5-12) on Simple Homeschool. Today I'm faced with the challenge of narrowing those 25 down to only 10. Why did these books make the final cut? These are the books the kids and I remember with almost a tender fondness and sometimes almost awe. These are the books that made us laugh and cry more than the others. These were books that seem like part of our family. And one final word: this is my list. In our reading-aloud life, I often took the day shift and my husband took the before-bed shift. His read-aloud list would be somewhat different and would certainly include The Hobbit, The Phantom Tollbooth, and The Cricket in Times Square. What's on your list? 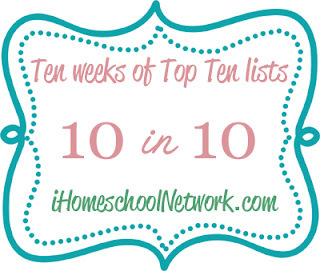 You can link up at Angie's Top Ten Tuesday! Fabulous selections. We have read all (on both lists) but the last- Small Steps: The Year I Got Polio. Based on your other favorites, I will definitely check out that title. Thanks for sharing. I'm so glad I came over to your blog. I've missed reading it. Isn't it hard to cut down your list to only 10. I asked my 3 kids to make their top 10 and only one kept it at 10.